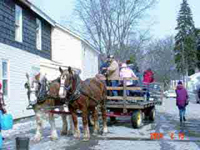 Every winter Wurtsboro hosts "WinterFest". This year's festival will be on February 5, as described in the article below. WURTSBORO, NY  Featuring the band, Hot Rod, and local celebrity, Randy Turner of Mix 97FM, this year the Wurtsboro WinterFest will be held on Saturday, February 5, from 11:00 a.m. to 4:00 p.m. on Sullivan Street. Under heated tents lining Veterans Park, Turner and The Carl Richards Band, which plays rock, bluegrass and country music, will perform alongside craft vendors as well as artists and artisans from the Rockaway Arts Alliance. 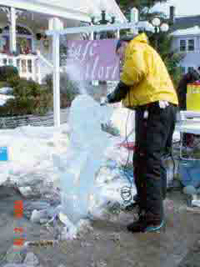 The collaboration of the Wurtsboro Board of Trade, Mix 97FM and Mamakating Rotary, the Wurtsboro WinterFest brings together ice carvers and amateurs to compete for a top prize of $600, 2nd prize of $400 and third prize of $200 in their the annual Ice Carving Contest. This years judges include Assemblywoman Aileen Gunther, Supervisor Charles Penna and Marcus Giuliano, chef and owner of Aroma Tyme Bistro in Ellenville. Horse-and-wagon rides begin at UnCommon Grounds Coffeehouse. Snowman making will take place near VanInwegan-Kenny Funeral Home, face painting will occur at the Valley Group Insurance and Looney Ballooney will entertain the crowd. For more information email vheller@frontiernet.net or call 845/888-0626.